In the recent years, there has been a great interest towards the contemporary Serbian cinema. After healing the wounds caused by the civil war, the new Serbian cinema is trying to stay away from the introspection and the movies that are made only for domestic consumption. A new generation of directors brings Serbia back to the international spotlight by participating in renowned international film festivals. Oleg Novkovic is a director who has previously shown his talent with his films, Normalni Ljudi (Normal People, 2001) and Sutra Ujutru (Tomorrow Morning, 2006) and every time he’s able to present something special. His last film, Beli, Beli Svet (White, White World, 2010) is a dramatic musical, which stays at the same time so far away from the aesthetics of the Yugoslav musicals, yet remains so close to their tradition and history. The film takes place in Bor, a town of southeastern Serbia, a region with a long tradition in mining. The main character is Kralj – King (Uliks Fehmiu), a former boxer and owner of the eponymous bar. Some years ago Kralj had a relationship with Ruzica (Jasna Djuric – Locarno Best Actress Award) who has killed her husband and was imprisoned for the last seven years. A few days before Ruzica’s release, Kralj meets by chance her 18 year old daughter Rosa (Hana Selimovic) and after a few drinks they quickly end up in bed. 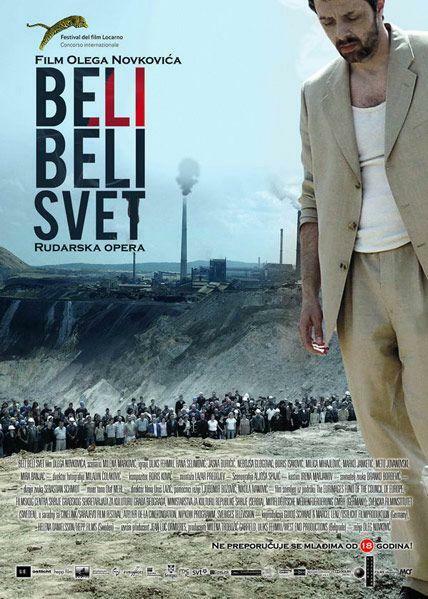 Beli, Beli Svet is eminently a low-voiced drama of characters following a theatrical austerity; Novkovic is working as a great dramatist in order to achieve this result. The screenplay is written by his girlfriend and poet Milena Markovic, and could be characterized as a modern time tragedy that follows the ancient patterns. Even if this description sounds cliché, it is accurate. The heroes are already devastated and their choices can only deteriorate their miserable condition. Everything around them is dying, their town, the people they know, even their new relationships are stillborn, and by determination they have no hope. This is a vicious circle of self-destruction where no one can escape, bigger and smaller crimes are committed with cold precision. There is no point of reference and support, so the expected fall will be dramatic and spectacular, especially when you’re a King. Even when they know that they are just one step away from the Knock Out, they don’t do anything to avoid it. Subconsciously they are waiting for this because it will redeem them from their miserable existence. Theoretically, Beli, Beli Svet is a dramatic musical but essentially it is a requiem, everybody sings but nobody dances. There is no resemblance with musicals, there is no choreography, the music is severe and slow, the depiction is minimalistic and the lyrics are sometimes mournful. Novkovic uses the songs and the expression through music to depict the interior monologues of his heroes. This method enhances their tragedy, something that could not be achieved just as effectively in prose. Naturally the work of composer Boris Kovac plays a particularly important role. His music is a fusion of Balkan mourns with a westernized orchestration that moves between the tango and orchestral music, without losing its ethnic identity. The filming is extremely realistic and serves the naturalness of the contemporary independent cinema. There are classic characteristics such as the use of hand-held camera, natural lighting and intense close ups, that give the exact sense of a drawing room play, nothing is superfluous. Combining the technique with the theme, the film could become a Serbian version of Vinterberg’s Festen. Since this is a musical, then it could be the right way that Lars von Trier had to follow for Dancer in the Dark, if he could remain faithful to the principles of Dogma 95. The town of Bor was not chosen by chance; Novkovic had already worked there filming the efforts of a group of miners to perform as amateur actors at a theatrical version of Bertolt Brecht‘s The Threepenny Opera. Bor is an excellent choice because the town dies, as the rest of the country does. Time seems frozen in the last period of growth and prosperity, somewhere during the 80’s, something that is obvious everywhere especially in the aesthetic that the city transpires. The miners are Bor’s last living piece, and the town is slowly transformed into a ghost. The miners are present during each exterior shot, constituting the canvas on which the characters act, in a way their presence connects the labor past with the rotten present. Contemporary Serbian filmmakers tend to represent a dark melancholy. This is a result of their defeatism that has not left their conscience yet. Despite the existence of touches of optimism, their films still remain dreary. The introspection and the analysis on what’s wrong have not finished yet, there is a feeling of recovery but it is still moderated. This factor makes their films to seem so natural, because their pessimism is not expressed by easy melodramas and exaggerated reactions; instead it is converted to an internal struggle. Oleg Novkovic remains faithful to the archetypes of drama, he presents his characters with naturalness and by using traditional techniques he manages to create powerful and true emotions.